Would you want a lovely bookend with a unique name or text on it? You are at the right place. Whatever bookend with an unique figure and text, or quote on it we can create for you. It only depends on your creativity what you want to see on it. For kids can be funny or an animal for adults creative and decorative. Don’t forget an unique personalised 3D printed gift can always make a nice little surprise for anyone as opposed to mass products. What shape of custom bookend (name, text, figure) do you want? Order from our existing bookends below! In addition to the beautiful colourful books, what else can make a bookcase look better? And besides, it is original too? BOOKEND! What kind of should it be: panda? Owl? These ideas have come to our minds, but based on your individual request, we will make what you would give as a gift. If you don't have idea just think of your favourite animals, instruments or funny tale character or novel's hero. 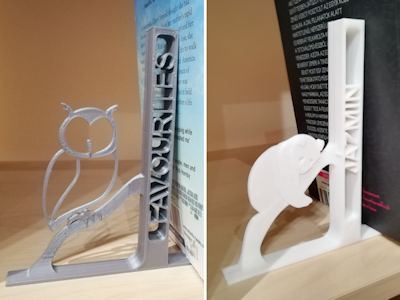 Personalised 3D Printed Bookend. These creative bookends are really amazing and cool gifts for kids, parents and grandparents too.